Dwight C. Holmes, known for ornamental architectural sculpting as well as painting and etching, was born in Albany, Oregon, 1900. He began formal art training in Galveston high school; studied five years in Texas Christian University, serving also as student assistant and art editor for College annual. He received his Certificate of Art and Bachelor of Arts Degree and became a faculty member in the Art Department. He left teaching to serve a five-year apprenticeship to achieve membership in Modelers and Sculptors of America. He studied with George Franz of Germany and Michael Lengyl of Austria. He has done ornamental architectural sculpturing over forty years and enjoys a broad art horizon that includes sculpting, painting, designing, ceramics, carving, gold-leafing, restoration, etc. He paints in any medium and any subject matter, but prefers oils and landscapes. He studied at Texas Christian University with Mary Sue Darter Coleman, Mrs. R. E. Cockerell, Sam P. Ziegler, and others. In California, he studied with George Flowers, at the Pasadena Art Institute, and in workshops with Lee McCarthy, Leonard Boreman, and etching with Bernard Wall. He has held membership in Painters' Club and Fort Worth Art Association; American Federation of Art; River Art Group and Coppini Academy of Fine Arts in San Antonio; Southwest Ceramic Society; San Angelo Art Club and Arts Council, and others. 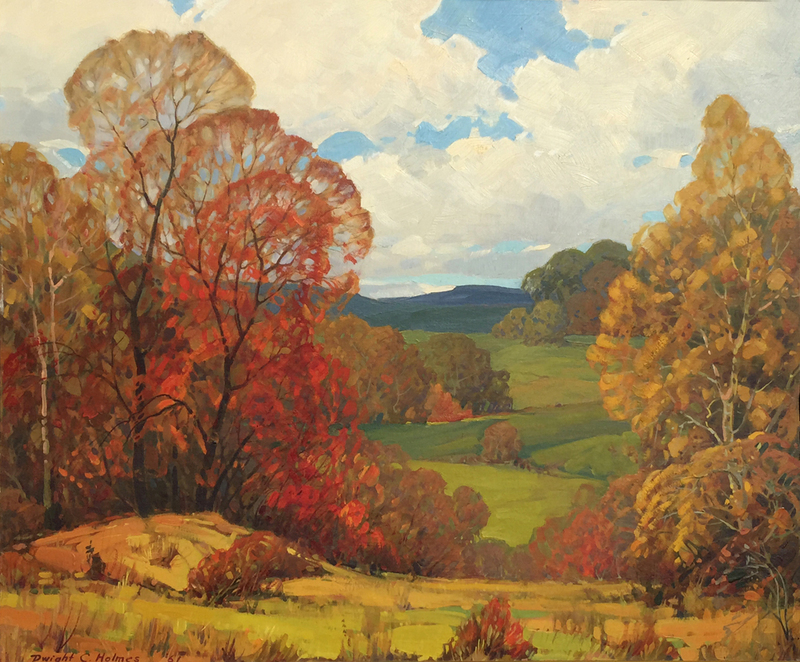 Dwight Holmes began winning art awards at age 13, and has continued receiving numerous honors and awards over the years. He has held art exhibits all over the Southwest, from Florida to California. His works have been shown in Boston, Cleveland, New York, Kansas City, Columbia, Mo. and elsewhere. He has painted along the Gulf, East and West Coasts; throughout Texas; in Mexico, New Mexico, Arizona, Utah, Colorado, California, Tennessee, Georgia, in the Great Smokies, Yellowstone, Grand Tetons, Red Rock Country, Hawaii, etc. He maintains a studio at 2401 Sherwood Way, San Angelo, Texas, but enjoys doing much of his painting out on locations, His interests include: juror for shows; giving criticisms and appraisals, and conducting art workshops and art colonies. In addition to museums works by Dwight C. Holmes may be seen in many private collections including: Mr. Levi Cole, banker, Canyon, Texas; Dr. A. McChesney, M.D., Columbia, Mo. ; S. Herbert Hare, former President Nat'l Association Landscapes Architects; Mr. Scott, Quaker Oats Co.; Mr. Moore, Anheuser Busch Co., New Orleans, Cecil Kangaroo, Insurance, Ft. Worth, James Buchanan Architect, Ft. Worth, and others. Several books have been published which give short histories of outstanding artists of Texas, in which Dwight C. Holmes is included: A History of Texas Artists and Sculptors, by Fisk; Art and Artists of Texas, by O'Brien; Art on the Texas Plains, by Elsie M. Wilbanks. Address: Dwight C. Holmes Studio: 2401 Sherwood Way, San Angelo, Texas Residence: 1920 North Parkway, San Angelo, Texas, 76901 Phone: 949-1773 Source: The following, also from Bill Cheek, is from the back of a signed Holmes print and personal communications of Raul Ruiz, a San Angelo artist and student of Holmes. 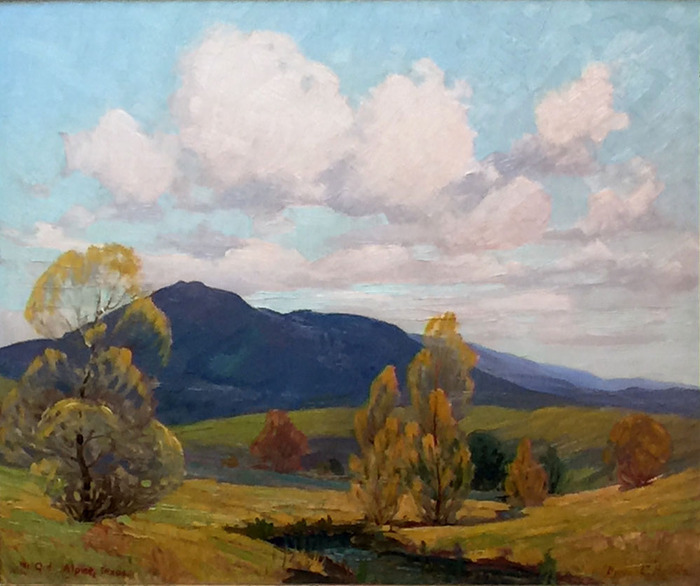 DWIGHT C. HOLMES, a young artist of promise, born June 12, 1900, in Albany, Oregon, came to Texas when quite young. He entered Texas Christian University Art Department in 1918, spending five years in study under the following: Mrs. E. R. Cockrell, Miss Mary Sue Darter and S. P. Ziegler, who were art instructors during that time. He was admitted to the Brush Society in 1918, Fort Worth Painters Club in 1924, and member of the Modelers and Sculptors of America, and was an instructor in T. C. U. Art Department in the summer of 1918. He is an architect, etcher, sculptor, and painter of landscapes, using oils as his medium. His awards include First Prize in Map Drawing, Oregon State Fair 1912; First Prize in Pen and Ink, Zinc Etchings and Charcoal Drawings at Texas State Fair 1922; First Prize in Landscape, Texas State Fair and San Angelo, 1925 and 1926. His work has been shown at several exhibitions of the work of Texas artists in Fort Worth and Dallas. His first showing in Fort Worth was with the Painters' Club at the fourth annual exhibition on the mezzanine floor of the Westbrook Hotel in November, 1924, as was that of Nan Overton, another young artist of that city. He has painted many alluring phases of Lake Como, Fort Worth, sketching the willow trees against the water, the gnarled live oak trees, the scarlet and russet Autumn, and numberless other colorful compositions. Source: A History of Texas Artists and Sculptors, by Frances Battaile Fisk, 1928 ADDITIONAL BIO INFORMATION FOR DWIGHT CLAY HOLMES Dwight C. Holmes began his study of art early, in Galveston, his instructor there being W. L. Dodge. 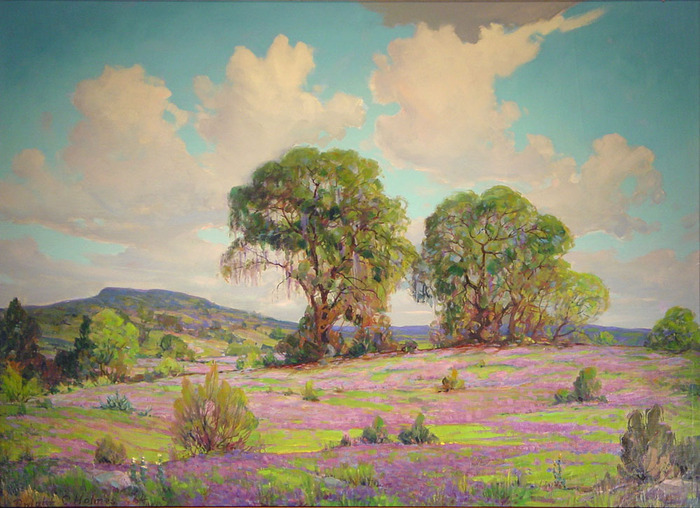 He entered Texas Christian University at Ft. Worth in 1918, studying art under Dura Brokaw Cockrell. He soon became student assistant in the Art Department of T.C.U. From 1918 until 1923, when he received his degree at T.C.U., young Dwight paid all his expenses by means of various types of art. Holmes grasps the beauties and opportunities near at hand. 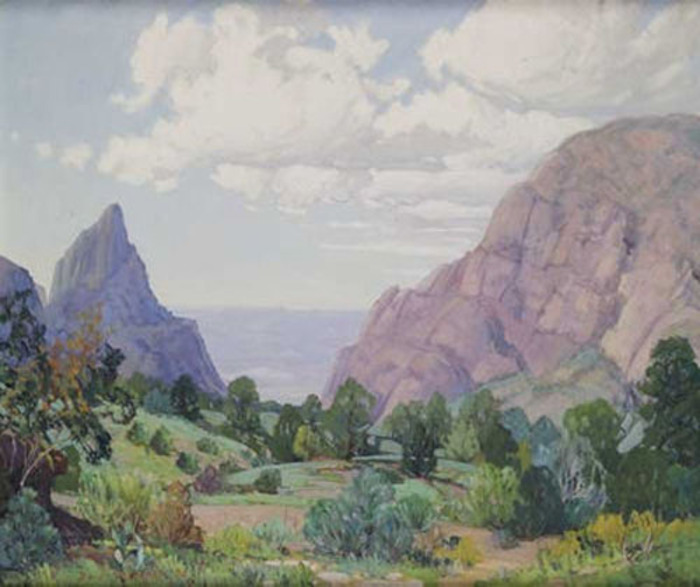 He has specialized in painting the beauty of the Davis Mountains and surrounding country in West Texas. He has done numerous landscapes in Oregon, Colorado, New Mexico, Texas and Old Mexico. Going abroad, he studied modeling with George Franz of Germany and Miska Lengyel of Austria Hungary. Holmes spends much time painting in the parks of Fort Worth. One extremely hot day, he was getting his vividness of color and heat in strong reds and yellows. A passing carpenter stopped, looked a minute and said, "You know, I've always wanted some one to paint a dream I had. I dreamed I died and went to heaven and hell, and you're just the man that can do it." For the past ten years Holmes has been connected with C. J. Sutton Company of Fort Worth and the Southern Plastic Relief Company of Dallas as a modeler. He has ornamented buildings all over the Southwest from forty-story hotels to one-story Spanish homes. In 1929 he received the commission to paint the murals for the Main Lounge of the Jockey Club at Arlington Downs. These murals cover sixty yards of canvas, depicting the history of the W. T. Waggoner family for the past fifty years, which in reality, parallels the industrial development of West Texas. (Letter) 3021 Cockrell St., Ft. Worth, Texas. Some of the information in this biography can be credited to"Art and Artists of Texas," Esse Forrester O'Brien, Tardy Press, Dallas, 1935.